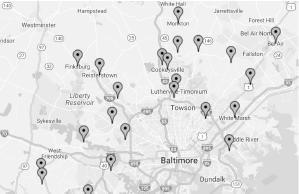 With over half a century of building expertise in the greater Baltimore area, we have an in-depth knowledge of the entire custom home process. Trust us to be your custom home builder in Maryland. wning a brand new home is a rewarding experience. Owning a brand new home that YOU designed is perfection. At Greenspring Custom Homes we strive for perfection. Each home we build is handcrafted with extraordinary detail. It will stand the test of time and provide you with enduring value—without breaking the bank. As your custom home builder in Maryland, we guide you through a smooth, transparent process so your dreams become reality. We welcome you to learn about our family-owned and operated company that has built over 300 houses around Baltimore. You can view a sampling of our houses and discover answers to some common questions. Please feel free to get in touch with us! We build custom houses in Baltimore and the surrounding areas, including Howard County, Carroll County, Baltimore County, and Harford County. Let us bring you over half a century of experience as we work together on the home of your dreams.